Learn to look at your team mates and make spaces for eachother! The ball is play from one side to the other. Three players play on side. One midfielder and two strikers. Always make sure there are 3 options. 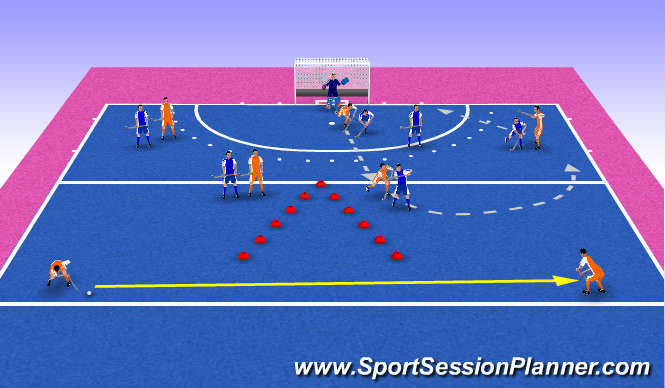 The players that passes the ball foreward (Passing is a MUST) joins in 4vs4. If there&apos;s no option play back to the other side. Try there. Their free man has to run more then, so more space. 1. The three options must be there. Midfielder choses, strikers follow. 2. In the ball is always a good option. Play it back and GO! 3. Back to the other side is always an option. The players that passes forward also allowed to dribble forward.